The Princess & The Geek: A Town Called Panic. 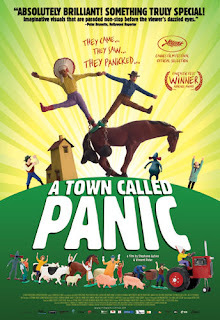 I just found out today that there is a feature length "A Town Called Panic" film being released. I'm not sure when it will be in Australia. But I so excited. A Town Called Panic is this completely wacky stop motion animation. the characters are, an Indian called Indian, a cowboy called Cowboy and a horse called (you guessed it) Horse. It's weird and strange and wonderful. There are only a few episodes, but this one is my favourite. I present. A Town Called Panic, episode "Cow-Hulk"